I have known for some time that the Twin Cities is a strong incubator of arts and culture. I was impressed by a documentary I watched last week entitled “Never Stop Singing” by TPT. Originally aired summer of 2009 it was recently rebroadcast on February 11th of this year. It celebrates the rich choral tradition of the state of MN. Thomas D. Rossin, conductor of chamber choir and orchestra, Exultate, describes MN as the “mecca” of choral singing. I believe it. I’m proud of our state. Here’s a few links to the transcripts of the interviews that were used for this documentary. These are just a handful of the many composers, conductors, and performers in choral music who live or work in this state. The largest reason why MN is the greatest state for choral singing is thanks to a man that wasn’t even a singer. F. Melius Christainsen. 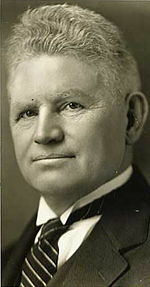 This man came to work for a little college in Northfield, MN called St. Olaf in 1892. Even though his main instrument was violin, his love of choral music and passion for excellence left a legacy that is still alive today. St. Olaf is internationally known and has been leading the way in this nation for decades. The following was taken from St. Olaf’s website. Does this make you want to sing? Celebrate February 29th – Buy my CD from my website! Don’t forget Dale Warland or David Dickau…one started a prolific small ensemble of singers, and the other is an incredible choral director and composer in Mankato! They each deserve there own post! Thanks for the reminder.